Brach Paris is nestled in the heart of the 16th arrondissement, neighbouring the Trocadéro, Eiffel Tower and Passy market. The hotel is located approximately 40 minutes from Charles de Gaulle Airport. In 1983, French design icon Phillipe Starck earned his stripes refurbishing French President Francois Mitterand’s private residence. 35 years later, he returned to the City of Lights to helm the design of Brach Paris, a space replete with comfort and elegance. The hotel delightfully mingles the avant-garde style of the early 20th century, with modern architecture and natural flourishes. Nowhere is this more apparent than the beautiful façade, with its mix of glass, concrete and spectacular greenery that descends from a large rooftop garden. This same garden, which spans almost 500 meters, provides fruit and vegetables for Brach Paris’ in-house restaurant. This elegant eatery offers a menu influenced by the flavors of the Mediterranean. Dishes are served from the open kitchen seven days a week. The bright rooms and suites are fully soundproofed and appointed with a high-quality sound system and personal smartphones for use during your stay. 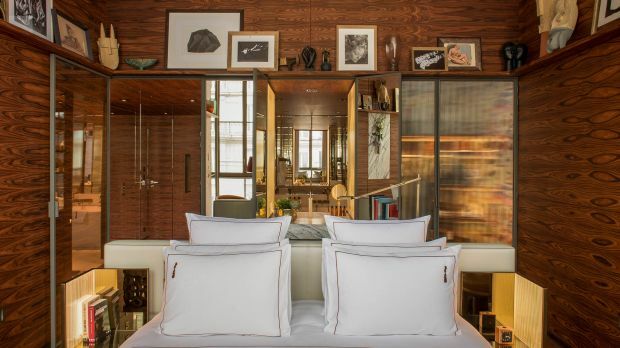 While all of the rooms are spacious, the suites feature magnificent terraces complete with lounge areas and various views over Paris' breathtaking skyline. There’s also a spa with swimming pool, tea room, and a ground floor level pastry shop (it is Paris after all!). An essential element of the hotel is the Sport Club, which features a 22-meter pool, heated plunge pool, sauna and a salt cave designed for pure relaxation. Guests can enjoy personalized advice, private coaching and wellbeing consultations from experienced coaches and sport therapists. Send an availability request with your requested dates to the Brach. Features 1 Queen bed, shower, high ceiling, Starck luxury design and access to the health club and pool. Features 1 Queen bed, separate shower and bath, high ceiling, Starck luxury design and access to health club and pool. Features 1 Queen bed, separate shower and bath, high ceilings, Starck luxury design and access to health club and pool. Features 2 Queen beds, separate shower and bath, Starck luxury design and access to health club and pool. Suite features King bed, terrace,private Jacuzzi and use of the Health Club and Pool. Two Bedroom Suite with two Queen beds, private Jacuzzi, terrace and use of the Health Club and Pool. Features 1 King bed, terrace, private Eiffel Tower view, Starck luxury design and access to health club and pool. Features 1 King bed, terrace, private Jacuzzi, Starck luxury design and access to health club and pool. Features 2 Queen beds, private terrace, Nordic bath, Starck luxury design and access to health club and pool. Features 2 Queen bed, terrace, private Jacuzzi, Starck luxury design and access to health club and pool. Features 2 Queen beds, terrace, Nordic bath, Starck luxury design and access to health club and pool.